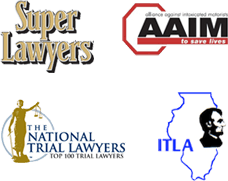 The Chicago t-bone accident lawyers, Chicago broad side accident lawyers and Chicago side-impact accident lawyers at the Nemeroff Law Offices have represented many victims of automobile, bus, motorcycle, and trucking accidents. As attorneys practicing in the area of personal injury for numerous years, we understand that accidents occur in various ways. A t-bone or side-impact vehicle accident occurs when a vehicle is hit on its side by the front of another vehicle. They can also result from your vehicle hitting a fixed or stationary object, forming the letter “T”. T-bone or side impact collisions are some of the most serious and cause a large amount of fatalities in car accidents. The side panels of a vehicle are the areas that have the least amount of safety features. Often, victims of these types of accidents sustain substantial damage and serious or catastrophic injuries. Over the past decade, car manufacturers have designed vehicles with the goal of protecting drivers and passengers from the dangers of side impact collisions. Many vehicles have become safer due to the installation of door and side panel airbags. These airbags were specifically designed to prevent serious injuries upon side-impact crashes. The severity of the side impact accidents depends upon multiple factors, including the region or area of the vehicle that is hit, whether the struck vehicle has side impact safety features, the speeds at which both vehicles involved were traveling at impact and the weights of the vehicles involved. All these factors will determine the scope of the impact. Showing that the driver who causes the accident violated any of these provisions can be important to establishing their negligence and winning the case. T-bone accidents often times occur in intersections. They can also happen when two vehicles are attempting to pass one another or changing lanes. Under most conditions, both vehicles are rotated from their original directions of travel. Upon severe impact or crash, the struck vehicle may roll over. Rollover vehicles can collide with pedestrians, objects and other vehicles. T-bone accidents and side impact accidents can cause serious personal injuries, including traumatic brain injury, paralysis and other spinal cord injuries. One of the keys to successfully winning a Chicago t-bone accident case is to retain a lawyer right away. Eyewitness testimony is often the key to winning or losing a case. Without eyewitness testimony from independent witnesses, you are often left with a he said-she said case where the injured person and other driver both claim they had had the right of way. In addition, with the advent of intersectional cameras at many intersections, it is important to force the municipality where the accident occurred to retain the video of the event to prove your crash. Many municipalities will tape over your crash within 30 days of the event if they are not requested to preserve the evidence. The same hold true for 911 tapes. At Nemeroff Law Offices, we have experience handling side impact collisions, t-bone accidents and broad side accident. This experience ensures that our client victims receive full and fair compensation for their injuries. If you or someone you love has sustained injuries or loss from a bicycle accident, contact Nemeroff Law Offices today. Our experienced bicycle injury attorneys are available to speak with you directly.